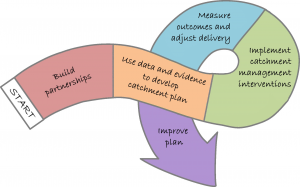 The Catchment-Based Approach (CaBA) is a UK government initiative, driven by the Rivers Trust throughout England and Wales. CaBA is a framework that creates partnerships; a place where individuals with varying interests to come together to discuss localised river management. It is a clear response to the challenge of the Water Framework Directive (WFD) and marks a step-change in thinking. Decision making has moved from being very centralised (within mainly government bodies) to being extremely inclusive and community-driven. This is a fantastic approach that will allow partners to work collaboratively to deliver multiple environmental benefits for great value by combining resources and expertise. Under CaBA, the country is divided into river management catchments (geographical areas representing the full extent of the main river – for CamEO this is the Ely Ouse). The River’s Trust’s role is to facilitate the formation and development of partnerships for each of these management catchments. Members include public (local government departments), private (businesses) and 3rd sector organisations (NGOs/interest groups) with local priorities and decision making contributing to river management as part of the national River Basin Management Plans. All of these partnerships created and published action plans in April 2017, which are available online. If you wish to get involved in a partnership but don’t know where to start, get in touch and we can point you in the right direction.